The company’s ferry, named 'Eastern Dream', measures 140 metres long, reaches a maximum speed of 22 knots and can hold up to 500 passengers and 66 vehicles. Aboard the vessel, you will find a wide range of luxury and economy suites, excellent restaurants and a variety of shops. It even boasts a nightclub and a large sauna, ensuring your journey is as stress-free as possible. Established in 2009, DBS Cruise Ferry strives to provide their passengers with the best possible service, with customer satisfaction at the forefront of their business, helping them become one of the largest operators in the region. They also have a large team of friendly, professional staff on board to help with any issues you may have. 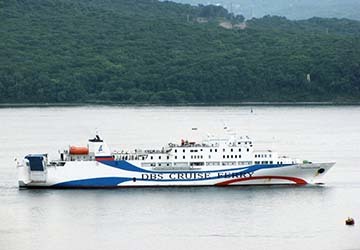 With directferries.co.uk you can find DBS Cruise Ferry timetables, fares and book DBS Cruise Ferry ferry tickets. Where applicable we’ll also compare DBS Cruise Ferry with alternative ferry companies.